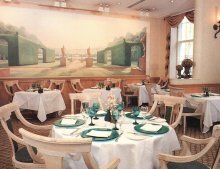 The Crescent is a spacious, light and attractive restaurant with many appealing features, including a vast mural of a country landscape ‘trompe l’oeil’ by renowned artist Lincol Seligman and a lion’s head fountain. Stephen Whitney (ex Mossiman’s and Savoy) is the head chef at The Crescent. He has created a menu which features an imaginative choice of dishes, based on seasonal specialties. 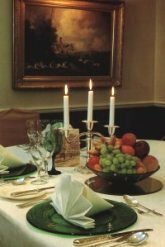 Private dining is also available with menus designed specifically for your evening. Starters include Chilled Roast Vegetable Gazpacho, with Tricolour Garnish, Marinated Tuna with Sauce Vierge and French Beans. Main courses feature Braised Lamb Shank with Orange and Basil, Crisp Grilled Fillet of Cod with Cabbage, Potatoes, Pancetta and Parsley and Caper Sauce. Highlights of the dessert menu are White Chocolate, Box of Tirasimu with Cappuccino Ice Cream or Pineapple Triplet. An extensive a la carte lunch costs £20 per person for two courses, £25 per person for three courses and includes half a bottle of wine per person, coffee and petit fours A two course dinner is £20 per person and a three course dinner is £25 per person and includes half a bottle of wine per person. Private parties are catered for, as are children and vegetarians. All major credit cards are accepted. I am wanting a vegetable mousse recipe that Chef Whitney had on the menu at Brasserie St Quentin in Old Brompton Rd. I did work there very briefly in 1991 and did make a celeriac mousse but alas I did not write it down. I hope Chef Whitney is able to help me with this simple request .